This recipe is formulated to meet the needs of aging dogs. Cage-free chicken, the number one ingredient, provides high-quality, energy-rich protein. Added glucosamine and chondroitin help support aging joints, while probiotics and added fiber help support digestion, even in in the most sensitive senior dogs. 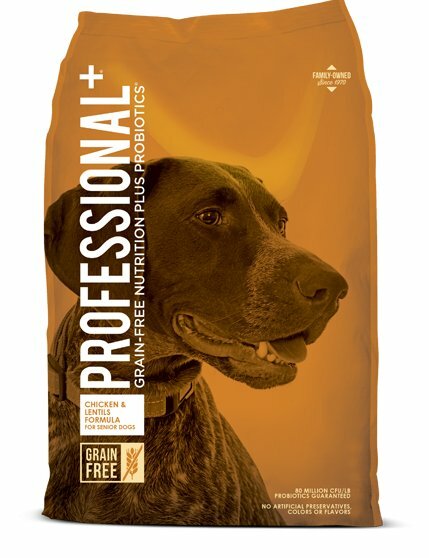 Chicken, chicken meal, lentils, peas, pea flour, sweet potatoes, fava beans, tomato pomace, chicken fat (preserved with mixed tocopherols), natural flavor, flaxseed, salt, DL-Methionine, choline chloride, taurine, glucosamine hydrochloride, dried Lactobacillus plantarum fermentation product, dried Bacillus subtilis fermentation product, dried Lactobacillus acidophilus fermentation product, dried Enterococcus faecium fermentation product, dried Bifidobacterium animalis fermentation product, chondroitin sulfate, vitamin E supplement, iron proteinate, zinc proteinate, copper proteinate, ferrous sulfate, zinc sulfate, copper sulfate, potassium iodide, thiamine mononitrate (vitamin B1), manganese proteinate, manganous oxide, ascorbic acid, vitamin A supplement, biotin, niacin, calcium pantothenate, manganese sulfate, sodium selenite, pyridoxine hydrochloride (vitamin B6), vitamin B12 supplement, riboflavin (vitamin B2), vitamin D3 supplement, folic acid.